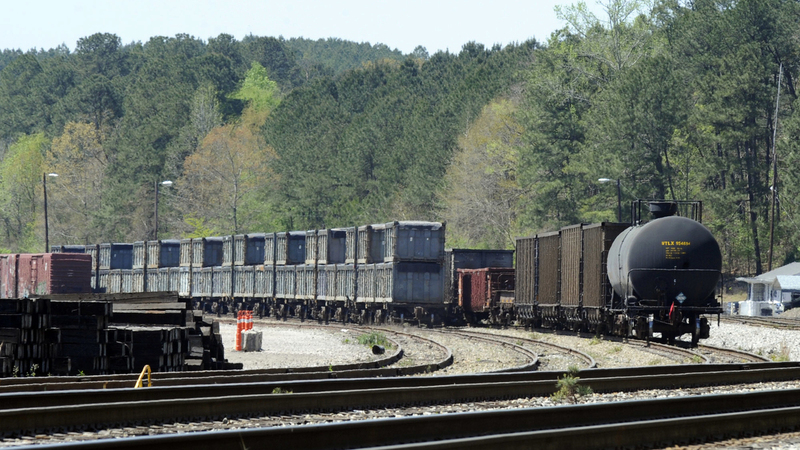 The Poop Train's Reign Of Terror In Small-Town Alabama Has Ended : The Two-Way Something was rotten in Parrish, Ala. Namely, some 100 million pounds of waste in a stationary train, waiting more than two months for disposal. But now, it appears the tiny town's nightmare is over. Containers loaded with tons of sewage sludge sit simmering in the sun last week in Parrish, Ala. More than two months after the "poop train" rolled in from New York City, Parrish Mayor Heather Hall says the material is leaving town. It's not often a town of roughly 1,000 makes national news. But then, it's not often a town faces a plight so ripe for media attention as Parrish, Ala.
For upwards of two months, a train brimming with sewage sludge has been squatting uninvited near fields used for youth baseball, simmering in the afternoon sun, making its noisome presence known even in the darkness of night. In a word, Mayor Heather Hall told The Associated Press earlier this week, "it smells like death." But it appears the tiny town may finally be waking from its long nightmare. "I have wonderful news," Hall announced Wednesday on Facebook, in what one might describe as a remarkable understatement. She explained that the containers of excrement aboard that train have been transported to and emptied at their intended destination, the landfill operated by Big Sky Environmental about 25 miles away. A few containers remained at the Parrish rail yard as of Wednesday afternoon, but she reassured her constituents those were just empties, soon to be removed, as well. But one might reasonably ask, what were some 250 tractor-trailer loads (or about 10 million pounds) of poop doing just sitting in a residential area? The more mathematically minded among us have probably already noted that comes out to roughly 5 tons of poop per capita in Parrish, which seems excessive. As NPR's Jacob Pinter pointed out earlier this month, the stuff in question comes from New York and New Jersey, which, to resolve complications with local regulations, often avoid those regulations entirely by regularly shipping their waste across state lines to areas with looser zoning laws. At least, that's where the poo in Parrish hails from — though it has taken something of a circuitous route to get there, as Dennis Pillon of AL.com has reported. He notes that the train came to Parrish earlier this year after getting blocked by Jefferson County, Ala., where it had originally planned to transfer its contents to trucks for the last leg to the landfill. So instead, the containers just sat in Parrish. And sat. And sat. "In the end, it took a little over 2 months for this material to leave Parrish," Hall said Wednesday. She added her thanks to those who aided their quest to get the matter resolved — but noted that her town's situation is not unique. "While what happened in Parrish was, to our understanding, an unprecedented event, there are [still] small towns like Parrish fighting this situation on a smaller scale," she said. "I will say this over and over....this material does not need to be in a populated area...period. It greatly diminishes the quality of life for those who live anywhere near it." And she asked lawmakers to pay more attention to regulating the problem. "If there had been even a small amount of oversight this might never have happened."